There is something about hearing the Word of God that gets in people. In fact, even among pastor friends of mine when one is expected to get nuanced and talk through biblical concepts in often enigmatic, smarty-pants ways, I increasingly enjoy simply hearing the Bible quoted to me - to discuss it, chew on it, and ultimately be further challenged and edified by it. In fact, please never hesitate to think you are sounding somehow brown-nosing, overly 'spiritual', or "he-probably-already-knows-this" by quoting Scripture to me. It will be a gift every time that I will hopefully choose to receive as such (I mean a friend did just this past Sunday refer to me publicly using Genesis 3:10 "I heard the sound of you in the garden and I was afraid, because I was naked, and hid myself" [p.s. - I was apparently the one in the garden in this scenario] - so I'm a little hesitant to receive wholesale all verses directed toward me). The apostle Paul says it like this in Romans 10 as he quotes Deuteronomy 30:14: "The word of God is very near you. It is in your mouth and in your heart so you can do it." Then later in verse 17: "Trust comes from hearing and hearing from the Word of Christ"
It is so good to have His Word nearby to hear it & do it so that trust in our Savior grows as might the do-ing that so pleases Him. 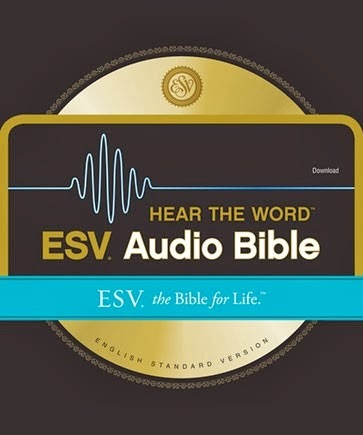 So downloading this free version of the ESV Audio Bible is the ideal soundtrack to start the year. I should note that this particular audio version gives easy access to particular books and chapters as needed.